“Students united will never be divided,” chanted nearly 13,000 students at the California Capitol in Sacramento on Monday, March 14. The students came together from across California college campuses to protest budget cuts to higher education, including 70 from San Joaquin Delta College who traveled by bus sponsored by the Associated Student Body Government to participate. 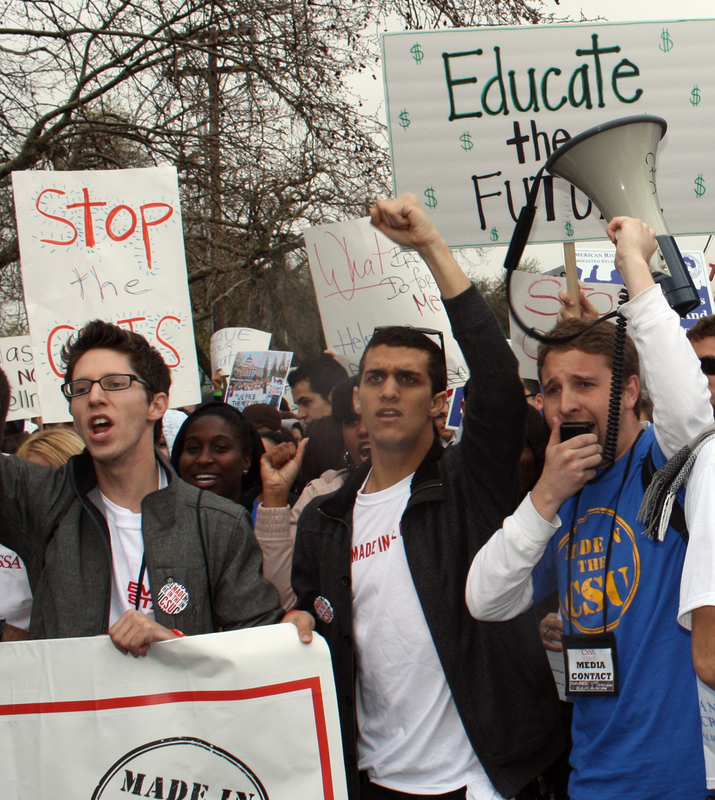 The event, known as the March in March, was organized to protest against $1.4 billion in total education cuts, including $500 million to University of California and California State University campuses and $400 million to California community colleges. “The chance that future generations will not be able to afford higher education was the driving force behind Delta College’s Associated Student Body Government getting involved,” said Senator of Legislative Affairs Lilliana Magana, prior to the event. Students made signs and wore shirts stating “march for your right to learn” in protest of the budget cuts. All came together to send a message to Gov. Jerry Brown that cuts to education are not acceptable. Delta Student, mother and grandmother Lily Warren, 50, said she was marching for herself, her children and grandchildren. “I am protesting to make a statement about the importance of education for our future,” she said. Oakland Resident Bertha Aviles, 40, said she was at the protest for her three children, one in middle school one in high school and one in college. “I want my children to have a future, if they cut funding to education the youngest one will not have a future,” said Aviles. Aviles was protesting with fellow parents and students of the Bridges Academy based in Oakland. The march lasted about three hours, with speeches from members of the Student Senate of California Community College addressing budget cuts. Speakers also included Delta College Associated Student Body Government President Patrice Burke who spoke at the rally, with her daughter at her side, against cuts and the need to keep education low in cost for future students to have a chance.